The recent headline that Cape Town is to double the size of its Convention Centre reminded me of a recent trip to the Design Indaba and the hair-raising, and dangerous, crossing which hundreds of visitors to the Centre were forced to make across Lower Heerengracht on the way from parking to the centre. The poorly thought through walking access on the streets outside the CTICC stood in stark contrast to the South African creativity on show inside it. Public spaces like those on our Foreshore are both unfamiliar, unwelcoming and unsettling. Access routes which welcome international visitors to the CTICC will be something that the new Convention Centre management will be forced to apply its mind to. 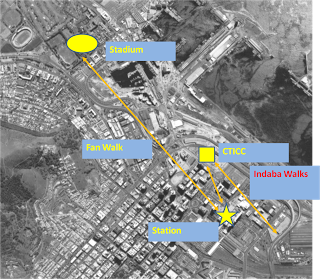 I would love to see some of the creative thinking that went into the Stadium access also be applied to the CTICC. This aerial mock-up shows just how close the CTICC is to vast tracts of land in the Eastern Foreshore where there is lots of space for parking. Better still the CTICC is, surprisingly, on the doorstep of the station. It just appears further because pedestrian access between the two has been at best ad-hoc, and at worst neglected completely. 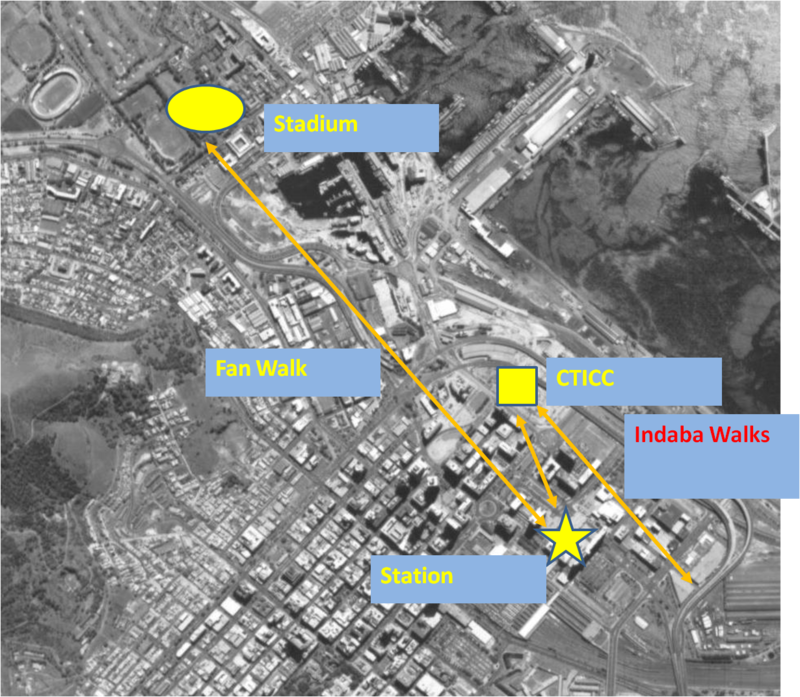 The CTICC development provides an opportunity to really implement some “liveable” streets design in the Foreshore and to give pedestrian accessibility in the City the priority it deserves.